Also serving communities of Lizella, Gray, Gordon. There are 23 Assisted Living Facilities in the Macon area, with 19 in Macon and 4 nearby. The average cost of assisted living in Macon is $2,716 per month. This is lower than the national median of $3,346. To help you with your search, browse the 62 reviews below for assisted living facilities in Macon. On average, consumers rate assisted living in Macon 4.4 out of 5 stars. Better rated regions include Warner Robins with an average rating of 4.6 out of 5 stars. Caring.com has helped 5 families in Macon find high-quality senior care. To speak with one of our Family Advisors about assisted living options and costs in Macon, call (855) 863-8283. Macon is "Where Soul Lives" thanks to ancient Indian mounds, an Italian Renaissance revival mansion, a rock and roll history tour and the largest collection of African American cultural artifacts. Macon is home to 19 assisted living facilities with an additional 12 located a reasonable distance from the city to serve the senior population — almost 17 percent. Assisted living facilities in Macon and elsewhere in Georgia offer professional assistance that includes activities associated with daily living. The cost of living in Macon is 17 percent lower than the national average and 13 percent lower than the overall cost of living in the state. The city of Macon is home to world-class medical facilities, including Navicent Health, in the event of medical emergencies or illness. The Macon-Bibb County Transit Authority operates reliable bus lines in and around Macon. Eligible seniors also have access to the authority’s Paratransit Service. Seniors aged 62 and older pay reduced fares to ride. Macon has an array of community resources for seniors, including the Middle Georgia Community Action Agency, an organization that provides social services for area residents. There are also eight other regional senior centers. While Macon attracts many seniors to its assisted living communities, it must be noted that the city as a whole suffers from a crime rate that is nearly double the national average. Macon’s crime rate also exceeds Georgia’s state average for crime. Annually, the national crime rate average is 2,837; in Macon, that number increases to 5,512. Macon summers are hot and humid with temperatures averaging 94 degrees in July. Some seniors with respiratory problems may find summers difficult. Macon winters are mild with temperatures rarely venturing below freezing. The average temperature for January is 47 degrees. Assisted Living costs in Macon start around $2,716 per month on average, while the nationwide average cost of assisted living is $4,000 per month, according to the latest figures from Genworth’s Cost of Care Survey. It’s important to note that assisted living rates in Macon and the surrounding suburbs can vary widely based on factors such as location, the level of care needed, apartment size and the types of amenities offered at each community. 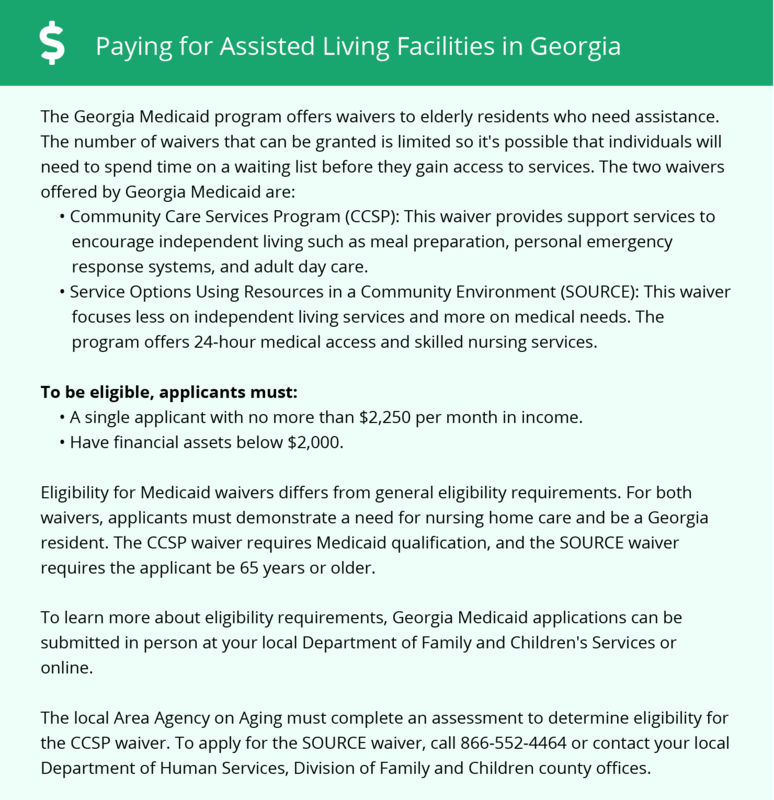 In Macon, as in other areas of Georgia, eligible seniors can expect Medicaid assistance to pay for assisted living services. Medicaid offers two types of payment waivers that include Community Care Service Program (CCSP) and Service Options Using Resources in a Community Environment (Source). To see a list of free assisted living resources in Macon, please visit our Assisted Living in Georgia page. Macon-area assisted living communities must adhere to the comprehensive set of state laws and regulations that all assisted living communities in Georgia are required to follow. Visit our Assisted Living in Georgia page for more information about these laws.